Your cat knows what she wants, and she knows how to get it. 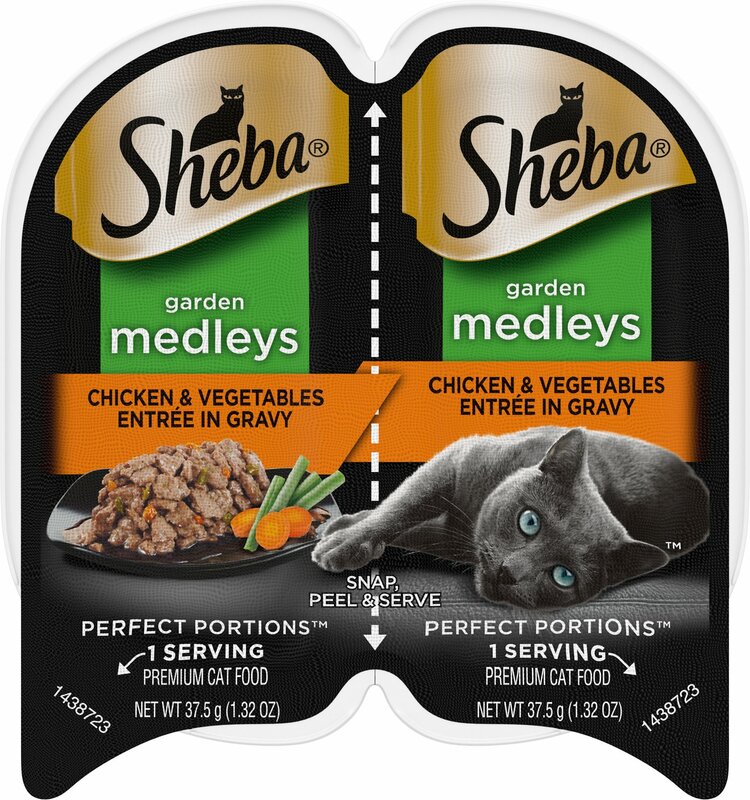 So, give her Sheba Perfect Portions Garden Medleys Chicken & Vegetables Entree in Gravy Grain-Free Cat Food. Made with mouthwatering ingredients like tuna, chicken, and vegetables, you can indulge your feline friend with nutrition she adores as much as she adores you. These unique packages offer two convenient servings of chicken, vegetables and gravy in a right-sized snappable tray that ensures freshness. Nothing says, "I love you!" like a fresh meal. 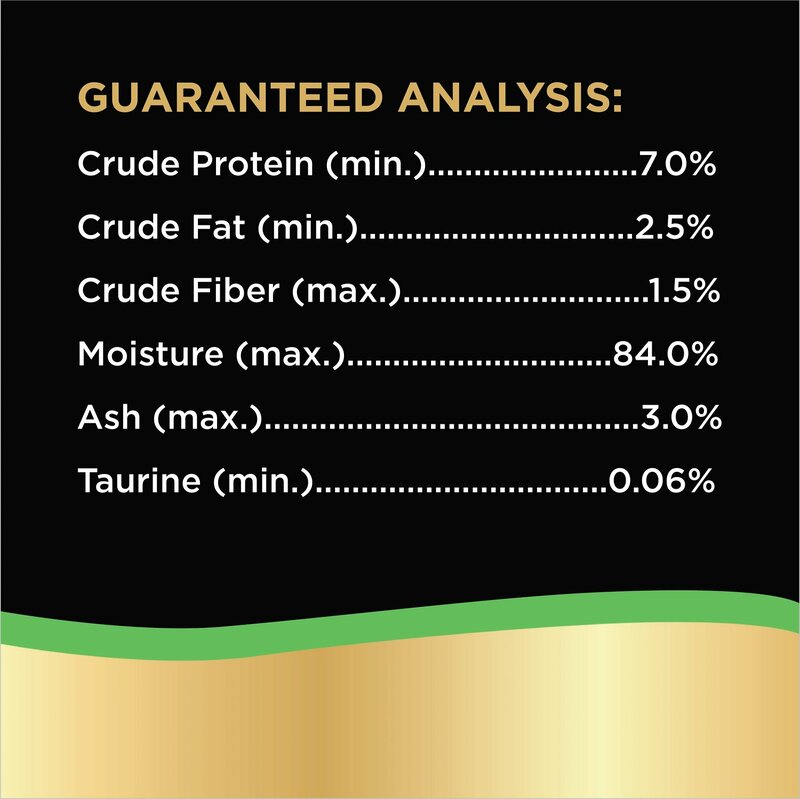 This wholesome wet food for cats is formulated without corn, wheat, or soy to avoid common allergens—and contains no artificial flavors or preservatives. 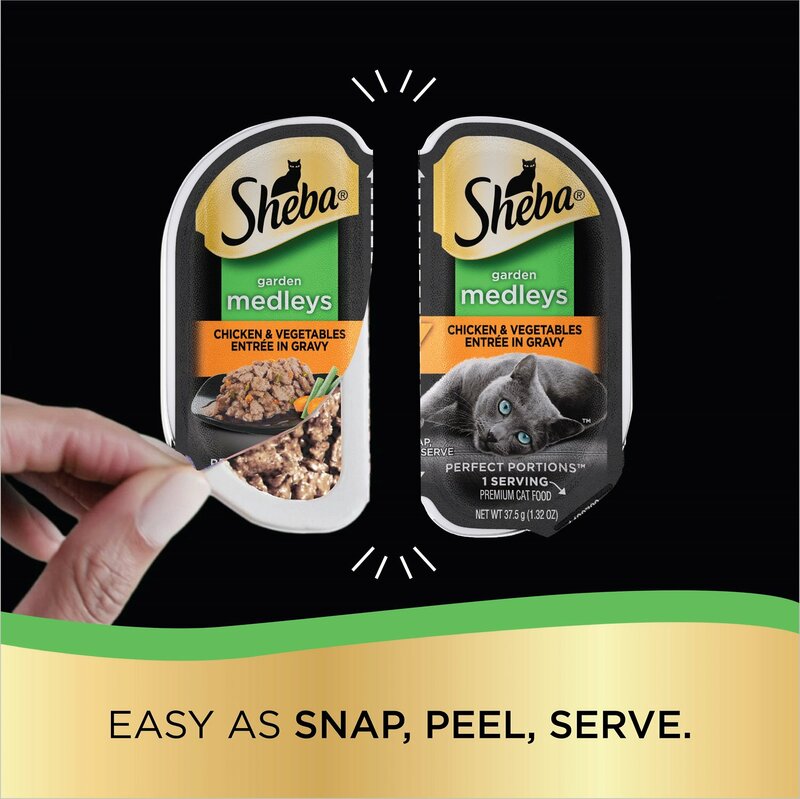 Savor every delicious moment with Sheba, and show your feline friend true love. Contains 48 wholesome servings of delectable, mouth-watering cat food with the irresistible taste of chicken, vegetables and gravy. These easy-to-serve twin-packs ensure freshness at every meal—just snap, peel, and serve. Crafted with quality ingredients to give your cat the essential vitamins and minerals she needs at any life stage. 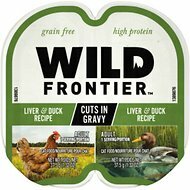 This delectable soft cat food is formulated without grain or corn, containing no artificial flavors or artificial preservatives. Even the pickiest of cats are drawn in by these extremely palatable meals, full of delectable flavors and inviting scents. 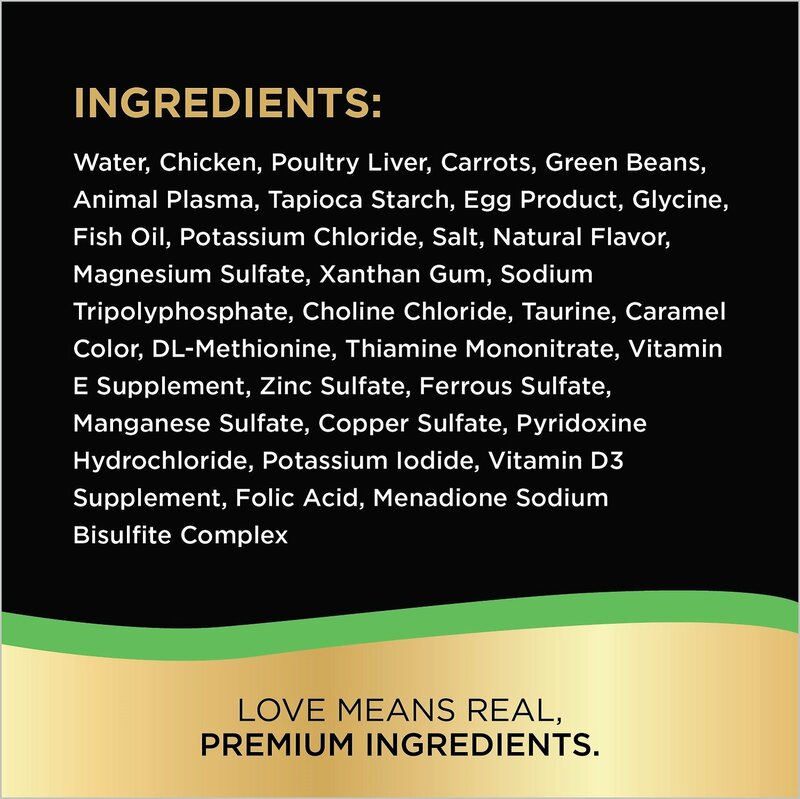 Chicken Broth, Chicken, Chicken Liver, Meat By-Products, Tapioca Starch, Dried Egg Product, Carrots, Green Beans, Glycine, Fish Oil (Preserved with Mixed Tocopherols), Potassium Chloride, Sodium Tripolyphosphate, Salt, Added Color, Natural Flavor, Magnesium Sulfate, Xanthan Gum, Choline Chloride, Taurine, Dl-Methionine, Thiamine Mononitrate (Vitamin B1), Vitamin E Supplement, Zinc Sulfate, Ferrous Sulfate, Manganese Sulfate, Copper Sulfate, Pyridoxine Hydrochloride (Vitamin B6), Potassium Iodide, Vitamin D3 Supplement, Folic Acid, Menadione Sodium Bisulfite Complex (Source of Vitamin K Activity). Feed adult cats 3 servings for every 5 pounds of body weight daily. Feed pregnant and nursing cats 2 to 3 times their normal amount. Feed a kitten up to 6 servings daily. I used to buy Fancy Feast all the time, but the cat that ate it passed away in May of last year oh, and I find that my cats don't throw up with Sheba because it's grain-free. I told my son's girlfriend about it cuz her cat was throwing up and she switched over to it and now her cat doesn't throw up anymore. My cats really like this food. The portions are good too. I feed them wet food 2x a day and free feed their kibble. They clean their bowls (which doesn’t always happen with other foods) and believe me there has been a lot of trial and error! Decent ingredients, solid company reputation AND my cats eat it. Yep, that’s a win! My cat loves this. She does not like pate or dry food. This gives her chicken and veggies in gravy and she really looks forward to eating this. I have a senior cat who needs a variety of wet food. If I give him too large a portion much of it ends up in the garbage. Louis's food never comes from the refrigerator. Our new kitty loaves the Sheba medleys. She comes running when she knows it's time to eat. 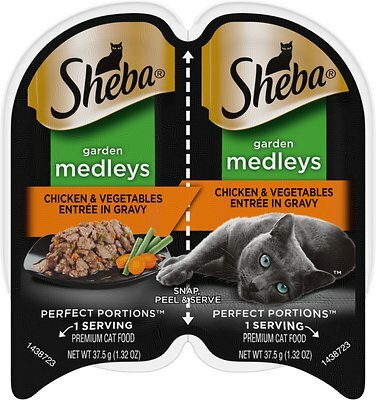 My cats love this new product by Sheba! And they are very picky eaters! 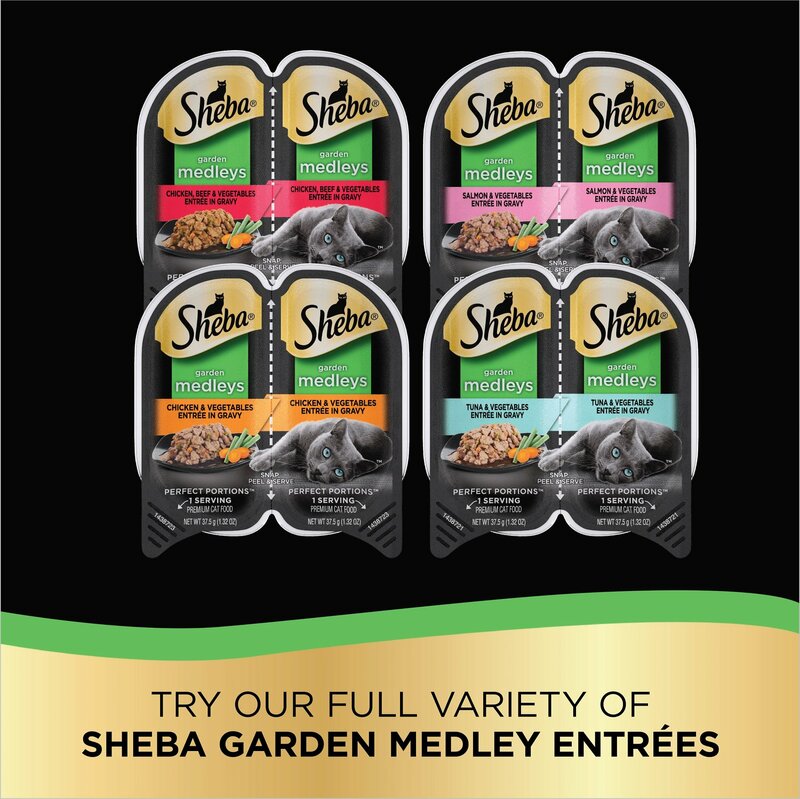 I recommend this and all the Sheba Perfect Portions catfood trays. It’s just the right portion for our cats and easy to serve. Just let the feline pick his favorites. This is one of the top two they prefer. My Siamese cat just loves it! 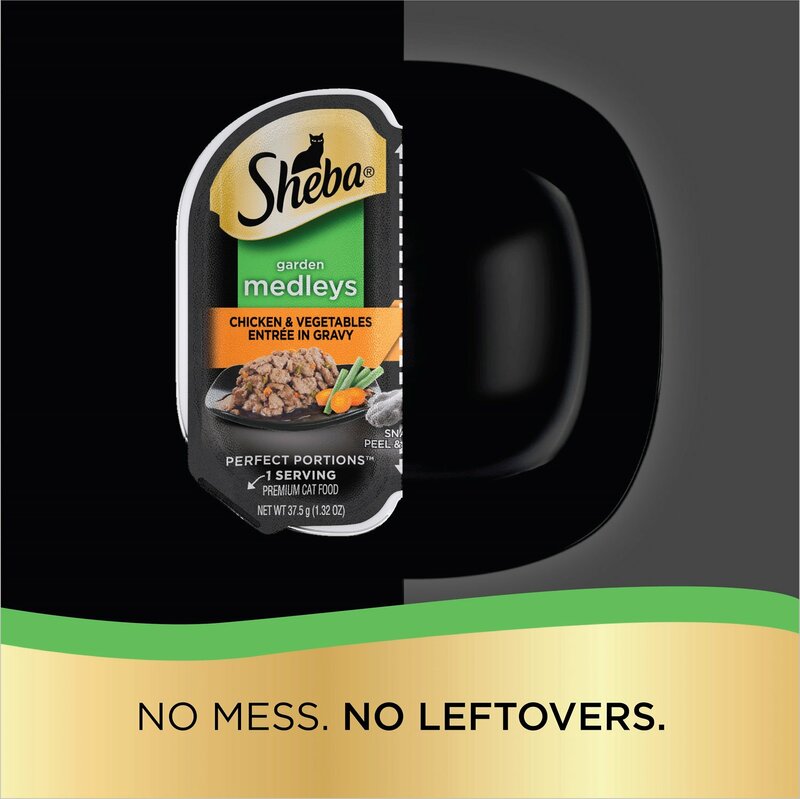 It is the second time I bought Sheba Medleys -> my cat loves it! Cats love this food. They will only eat this cat food as a treat. Can’t find this variety in stores. My cat absolutely loves it and she is very picky. Love the auto ship service, now I don’t have to worry about running out.